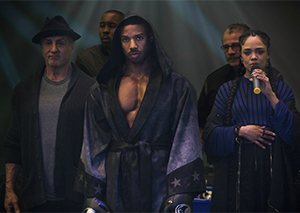 Creed II’s strong emotional core makes it a big winner. First, it’s important to understand every movie follows a formula. No matter how the story is presented, updated, modified, transformed, deformed, what have you — there’s still a formula to the storytelling. It doesn’t matter if it’s directed by Martin Scorsese or Alan Smithee. That’s said now, right up front, because it’s too easy to deride the Rocky movies as “formulaic.” People who take that stance are missing something special, particularly now, with Rocky having moved from fighter to trainer. Well, Rocky’s still a fighter — in the ring of life. And this Thanksgiving holiday, that’s something for which moviegoers should be thankful. Prior to immersing himself in the Marvel universe with Black Panther, Ryan Coogler gave the Rocky story a fresh start with Creed and finally got Rocky Balboa, the Italian Stallion, out of the squared circle. A sort of symbiosis formed between Rocky and Adonis Johnson (Michael B. Jordan, Fruitvale Station) as Rocky trained Adonis (son of Apollo Creed) and Adonis gave Rocky renewed purpose following the passing of Adrian and Paulie. Now Adonis is being challenged by Viktor Drago (Florian “Big Nasty” Munteanu in his feature debut), son of Ivan Drago (Dolph Lundgren, a co-star in Stallone’s Expendables series), the Russian brute who killed Apollo during a championship bout in 1985. At first blush, it sounds like a cheesy idea. But it works. Really well. It’s an unprecedented feat to watch the same actor portray the same character over a 42-year period and watch him age on the screen, ravaged by the challenges of both the movie world and reality. Love him or hate him, Stallone’s had his share of highs and lows. And he’s been quietly sharing his insights through the Rocky series, which hit an emotional zenith with Rocky Balboa (breaking from the Roman numerals convention, which would’ve made it Rocky VI). Coogler handled the writing of Creed, with Stallone going on to be nominated for the Best Supporting Actor Oscar 39 years after he was nominated for Best Actor in the original Rocky. Now, Stallone’s back behind the keyboard (don’t forget, he was also nominated for Best Original Screenplay for Rocky), this time collaborating with Cheo Hodari Coker (Luke Cage on Netflix) and Juel Taylor (moving from the sound department to screenwriting for the first time). The main event, that fight between Adonis and Viktor, is merely window dressing when considering all the meat on this feast of a Thanksgiving release. For starters, there’s the repeated theme of identifying motivations. Why does Adonis want to enter the ring and risk his life? Does he need to prove something to other people or to himself? And from there, Adonis goes on to get engaged to his long-time girlfriend, Bianca (Tessa Thompson, Thor: Ragnarok). But even the promise of wedded bliss is disrupted by concerns their daughter might carry her mother’s hearing loss. That leads to one of Creed II’s many powerful moments. Rocky asks Adonis how he’ll handle things if his daughter is deaf. Adonis replies that he can’t think that way. Rocky offers the counsel that Adonis has to be prepared to handle the unthinkable. It’s all about the importance of character and the ability to face life’s challenges — and conquer all those fears that get in the way of achieving a better life. In these turbulent days, the quiet, wise soul running through this 42-year series is more relevant than ever. And it looks like the seeds are being sown for more soul in movies. The director is Steven Caple Jr., marking only his second feature film (following on last year’s The Land). Creed II is a remarkable accomplishment, the kind that bodes well for the future of his career and movies as a whole. But, yeah. Okay. The match-up between Adonis and Viktor makes for a rousing finale — and the requisite scenes of preparation, with Adonis removed from his comfort zone while Viktor sticks to his trusted regimen of Russian resolve, work their movie magic. Throw in a couple really cool cameos, and there are plenty of reasons to savor Creed II. All that said, as the action comes to a close, Stallone and team find the right, personal note to finish the story. Maybe — just maybe — now’s the right time to hang up the gloves.